Digital Literacy: An NMC Horizon Project Strategic Brief was commissioned by Adobe Systems to explore an increasingly pressing challenge for United States higher education institutions: advancing digital literacy among students and faculty. Unfortunately, lack of agreement on what comprises digital literacy is impeding many colleges and universities from formulating adequate policies and programs. The aim of this publication is to establish a shared vision of digital literacy for higher education leaders by illuminating key definitions and models along with best practices and recommendations for implementing successful digital literacy initiatives. Findings from our digital literacy survey as well as from the NMC Horizon Project environmental scanning process will depict the benefits of digital tools and approaches, providing positive exemplars in higher education. Alexander, B., Adams, S. & Cummins, M. (2016). 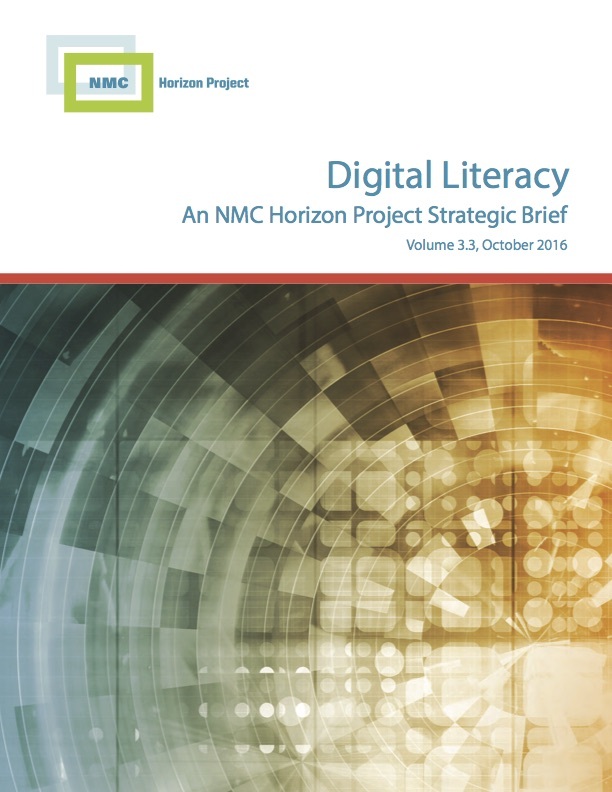 Digital Literacy: An NMC Horizon Project Strategic Brief . Austin, Texas: The New Media Consortium. (Volume 3.3, October 2016). Retrieved April 24, 2019 from https://www.learntechlib.org/p/182085/.